Allison is a Storyteller, Singer-Songwriter, Writer and Educator. She believes in the power of story, song and the arts to build community, and teach us about ourselves. Welcome to the Music Store Page! Here you can listen to songs from my CD’s and if you like ’em and wanna keep ’em, there’s links to buy them in packaging and snail mail or download. Hope you enjoy! 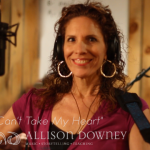 Allison’s NEW Single, “Can’t Take My Heart!” is available for download HERE. In the song, Allison gives cancer a piece of her mind, but not her heart! Alternate versions are available for more sensitive ears. After Medical Expenses, 10% of proceeds go to mucosal melanoma research. Across the Sea explores the gamut of life’s emotions through the themes of distance and longing without taking on a melancholy tone, due in large part to the lightness and humor of Allison’s stories and performances. The album takes us from the streets of a homeless person (“Please Help!”), to a middle school dance (“All That Matters”), to the dusty earth of Texas, fantasies of Ireland, an English pub at last call (“Across the Sea”), and the backyard filled with the critters (“More Than Human”). Stick around for hidden tracks from Allison’s alter-egos, Carmen & Melba! Wind at Your Back, Allison’s debut album, captures the spirit and intimacy of her live performances, with the help of some of Austin, Texas’ top musicians. The album kicks off with the rocking “Wind at Your Back” inspired by the Irish blessing and takes you on a journey that ultimately brings you home to the meaningful and conversational folk song, “Connections.” She explores whimsical love in the everyday moments (“The Fact of the Matter”/”You’re the Answer”) and across great distances (“2,000 Miles”), the ambiguities of relationship (“Diamond’s Edge”/”Fallen Angel”) and the love for a child (“Cate’s Cradle”). In “Shoulda Known Better” Allison addresses the issue of domestic abuse from the child’s perspective with a humorous approach and a twist at the end. She gets your body swaying to the beat of “Caribbean Life” and captures the sentiments of a nation with her poignant tribute to the brotherhood revealed “On the Day” of September 11, 2001 (a song that received airplay on radio stations across the country).